David Blay’s booming baritone voice resonated “Elvis” hits across Recreation Park Saturday, October 3 in Willimantic/Windham, Connecticut. 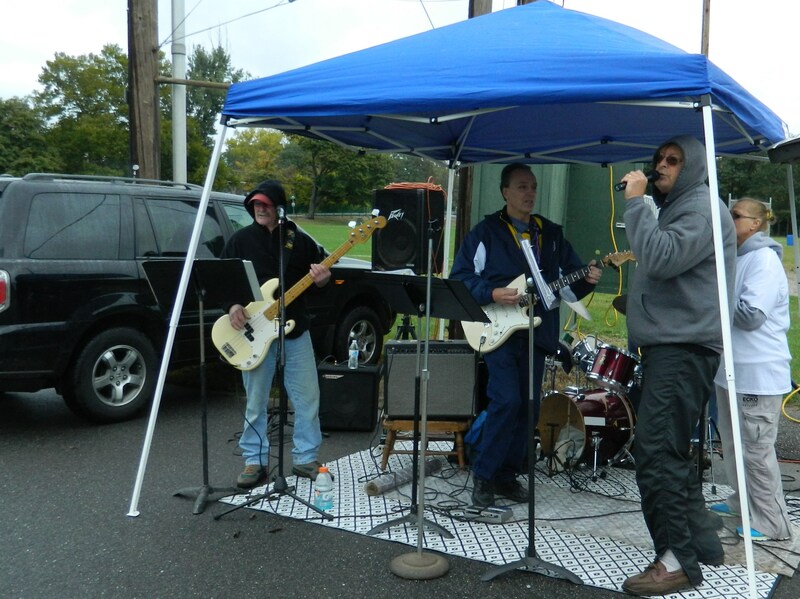 Blay, lead singer for “Dave & the Cadillacs” and his oldies band turned out to help the “2015 Color Craze” raise money to buy athletic equipment for the newly established Charles. H. Barrows STEM Academy, located in North Windham. 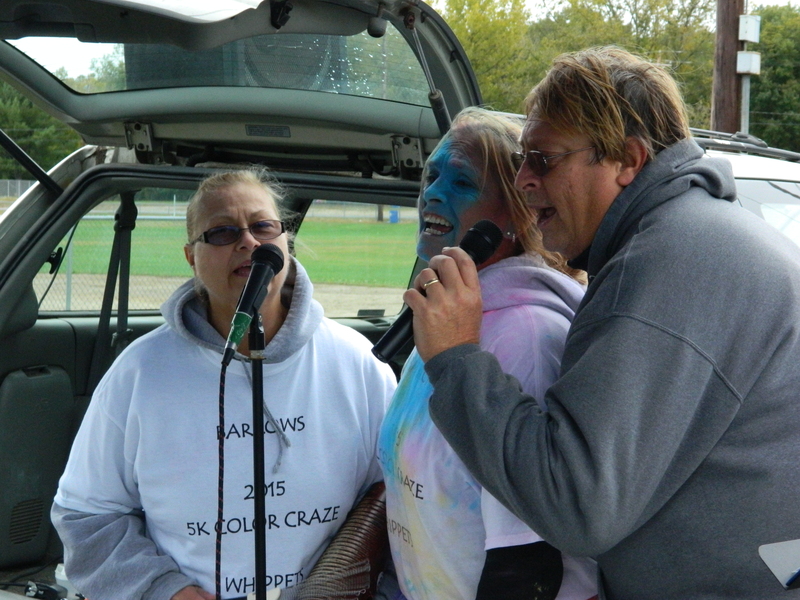 Organized by Cynthia Lovely, Blay’s neice, “2015 Color Craze” featured a 5K fun run and walk. As a Booster Club chairperson for the Tuckie Road academy, Lovely suggested Color Craze to raise money for a school athletic program. “The academy began as all elementary. It is now fully enrolled with elementary and middle school students and needs an athletic program,” said Lovely, whose two children attend Barrows Academy. 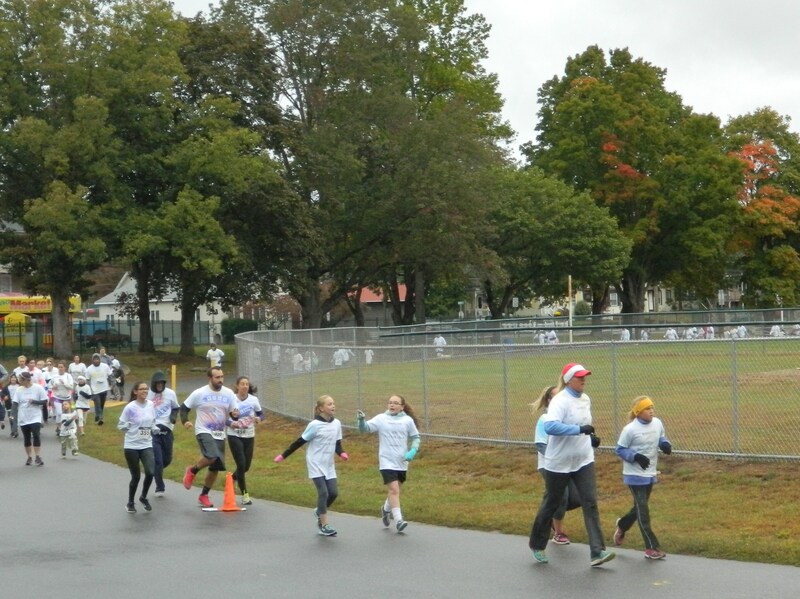 (Lovely gave a shout-out to Heritage Columbia, CT for sponsoring the event tee-shirts). 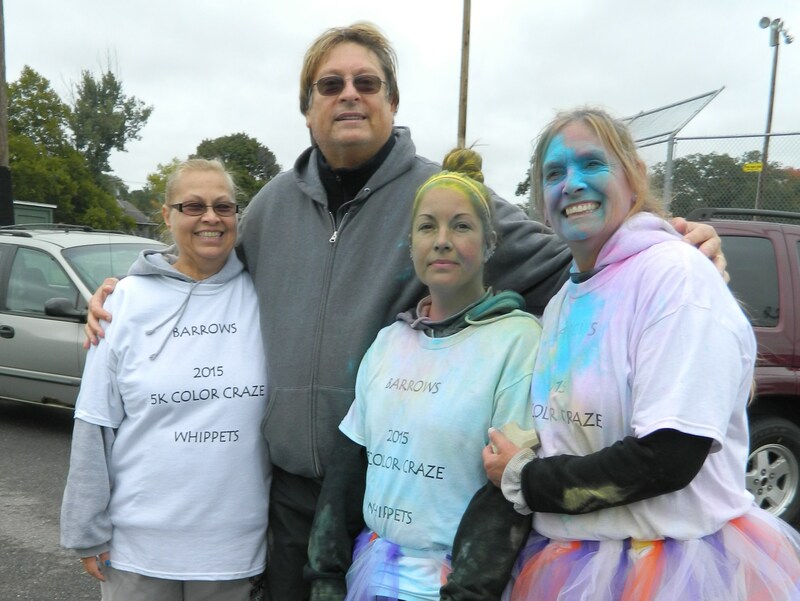 “2015 Color Craze” 5K Run/Walk gets underway at Recreation Park in Willimantic/Windham, Connecticut on October 3. Dave Blay shown with his wife Nancy Blay (left), his neice Cynthia Lovely and his sister Cindy Blay. With “Color Craze” in its second year, Lovely sought to add entertainment, a DJ positioned near the ice rink warming hut where the run/walk began and a live band en route. Enter “Dave & the Cadillacs” – including Dave, Doug Bradley on bass guitar, Randy Rydzowski playing lead/rhythm guitar, Geoff Wilson on drums and as back-up singers Dave’s wife Nancy Blay, and his sister Cindy Blay who is Lovely’s mother. 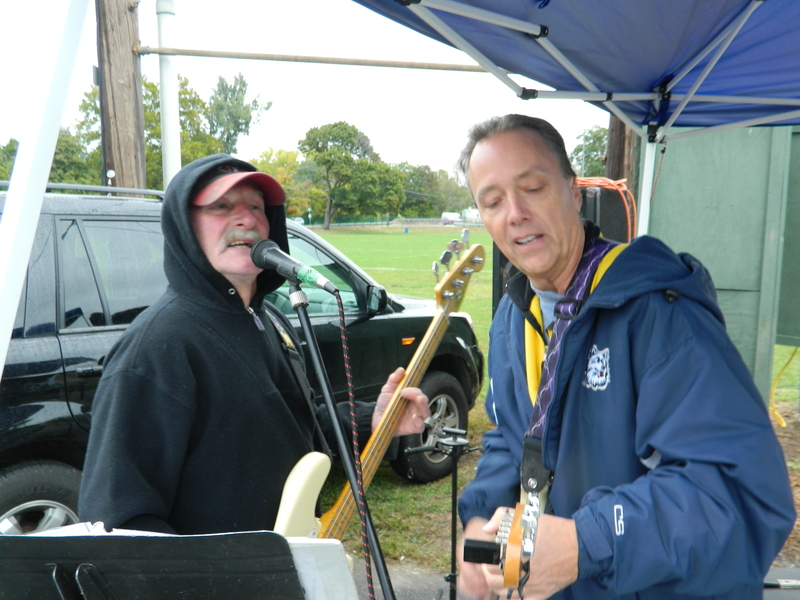 The band performed oldies for about an hour and a half starting at 10:00 a.m. on Saturday amidst sporadic rain showers and chilly temperatures in the 50 degree range, weather which Dave acknowledged is not easy on the vocal chords. Nonetheless, he and the “Cadillacs” were determined to be there to help the kids. “I think it’s a worthwhile cause,” said Dave, a former competitive interscholastic athlete. Doug Bradley on bass, Randy Rydzowsk on lead/rhythm guitar. Back-up singers Nancy Blay and Cindy Blay join lead singer Dave Blay. 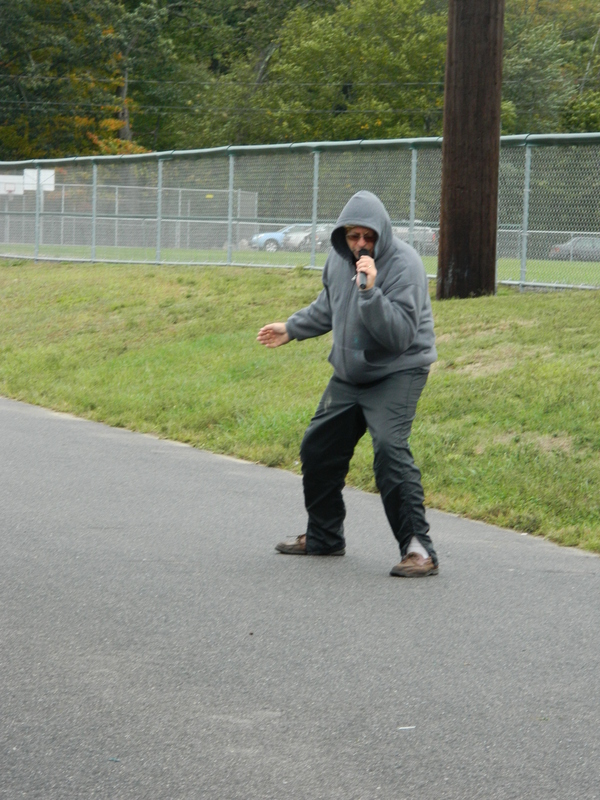 Although Dave prefers ballads, song sets for the event were faster paced – with plenty of Elvis tunes. 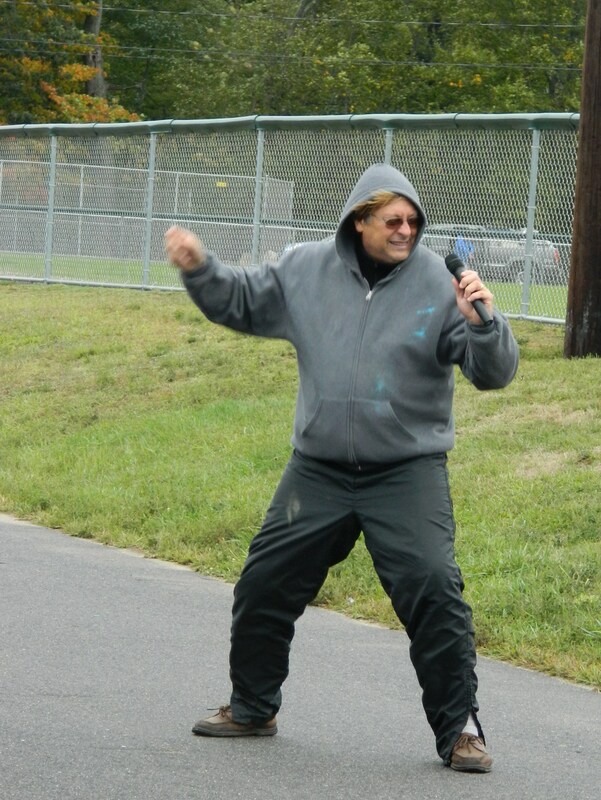 At times Dave stepped forward and in the”King of Rock & Roll” style, gyrated to the left then gyrated to the right. “It was 1977, the last home game. I caught a pass from Larry Hayden who had grabbed it half-court. At the foul line I dribbled by defensive players to make a one-handed dunk,” recalled Dave, also mentioning Mark Danks as part of the scenario. 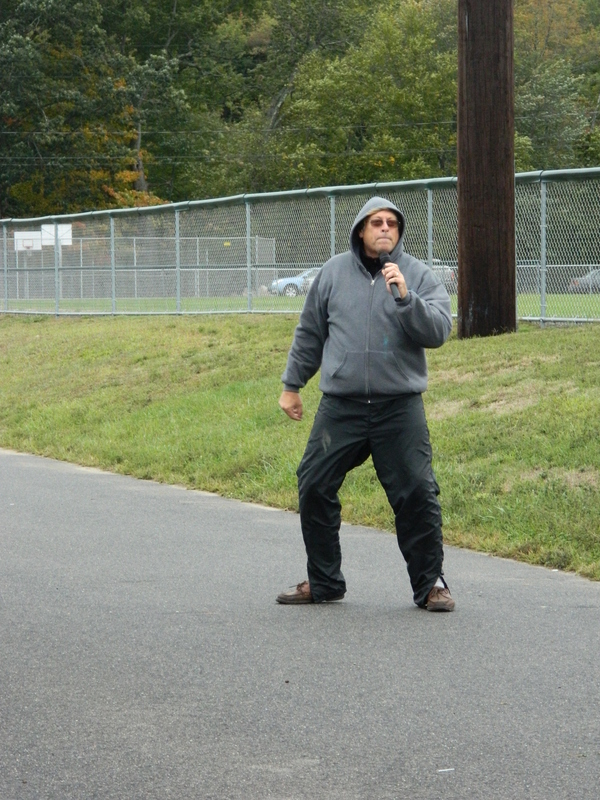 It was at WHS that Dave’s voice was noticed by Timothy Quinn, the school’s well-regarded director of music. “My voice had changed and Mr. Quinn needed a baritone for the choir. I learned a lot,” noted Dave. Even during choir practice Dave couldn’t help but break into Elvis songs. 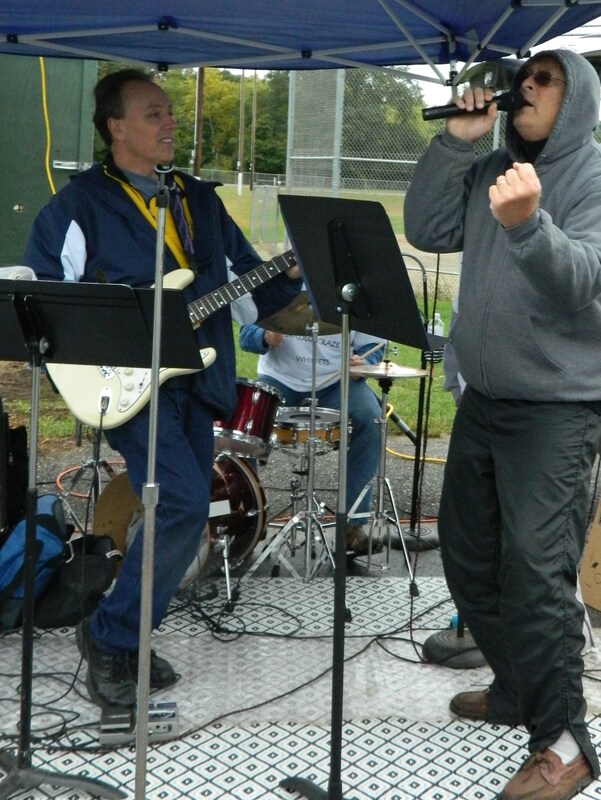 These days, singing Elvis songs is part of Dave’s act. He has been performing and entertaining since childhood when he and his sister did a ventriloquist show in the basement of their family home, charging the neighborhood kids a nickel to attend. In more recent times, his singing took off while he was working in security at the Mohegan Sun Casino in Uncasville, CT. In 2001, Dave participated in a talent show at Mohegan Sun and once again his voice was noticed – this time by folks in management at the casino who subsequently asked him to do more shows for the employees. Performances followed in the Wolf Den arena and the Cabaret Theatre, as well as, a Valentine’s Day broadcast on WCTY. Often Dave noted, he passes out scarves to appreciative audience members and makes eye contact when he’s singing, just as Elvis did. One performance Dave cherishes is of a lesser known Elvis tune, a beautifully sentimental song called “On A Snowy Christmas Night” which he sang for a Christmas Show at the casino. “For you know the Lord’s been good to you on a snowy Christmas night …..”. He now has a CD titled “Dave Sings Elvis Favorites” recorded locally by Gary Pomo. 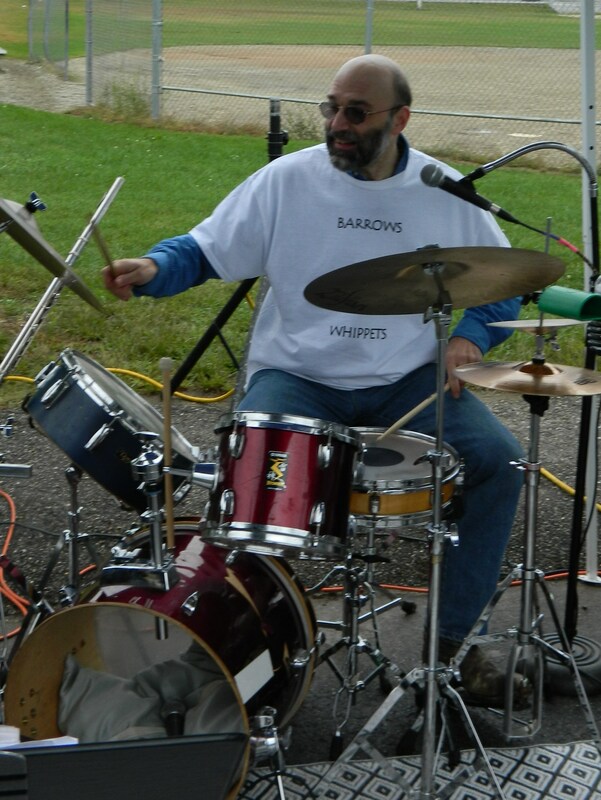 In addition, “Dave & the Cadillacs” do area gigs. Listen to Dave Blay sing the Elvis hit “Little Sister” in this U-TUBE video posted by his wife Nancy. Go to http://www.cbs.windham.k12.ct.us/ to learn more about the Charles H. Barrows STEM Academy. Visit Dave Blay’s Facebook page to find out how to get his CD and where “Dave & the Cadillacs” will be performing. LOVE IT! He was So grateful and LOVED you!! !